Use your Xbox 360 headset or Kinect sensor to chat with your friends through the Xbox 360 console, either as a party or in private conversations. If you’re experiencing problems with chat, the Xbox Live service may be down. Check for service alerts at Xbox Live Status or see if there's an Xbox Live service alert at the top of this page. For other problems with Xbox Live chat, see Troubleshoot problems with Xbox Live chat on Xbox 360. Optional For faster typing, connect the Xbox 360 Chatpad or a USB keyboard to your console. Setting up communication is simple. Just connect your Xbox 360 headset or Kinect sensor, and then set your online safety settings. You can allow communication with everyone or just your friends. If you're using a wired headset: Connect it to your controller. If you're using a wireless headset: Connect it to your console. On the controller, press the Guide button . Set the Kinect microphone to On. Tip Calibrating the Kinect sensor for speech and audio may improve your chat experience. To do so, see Using the audio tuner on your Xbox 360 Kinect Sensor. For more information on using voice commands with Kinect, see Kinect voice commands. Go to Settings and select Privacy. Select either Everyone, Friends Only, or Blocked, and then press B . Note If you're using a child account on Xbox Live, the adult account must approve this change. Private chat is a conversation between you and one other person. No one else can hear or participate in this chat. Your friend can be playing the same game as you, playing a different game, watching a movie, or listening to music. During an Xbox Live multiplayer game, in addition to your public in-game communication. While hosting an Xbox Live party. Connect your Xbox 360 headset or Kinect sensor, and then sign in to Xbox Live. 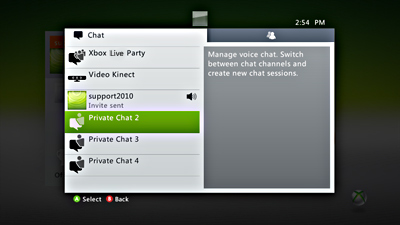 Select an available Private Chat channel, and then select or enter the gamertag of the person you want to chat with. Select Send Message. The person you invite has five minutes to accept your invitation. After five minutes, Xbox Live assumes that your friend is unavailable and cancels the invitation. You can try to send another invitation later. Note When someone declines a chat invitation, the sender doesn’t know whether the invitation had expired or was declined. The sender only receives a notification of the invitation cancellation. You can change the chat channels to choose who you want to talk to. Press the Guide button . Select Party and then Party Options. Select Chat Channel and then Game Chat. Select Chat Channel and then Party Chat. Select Party and then the player's gamertag. Would you like to contact Support regarding the "Xbox Live chat on the Xbox 360 console" issue you were reading about or a different issue?